Big Fan is the directorial debut from The Onion writer Robert D. Siegel, and the man behind the career reviving Mickey Rourke outfit The Wrestler. Still taking it’s grounding in the sports world, this intense and raw character study drama moves the action from the ring to the football stadium car park. Patton Oswalt will be familiar to most as the shlubby thirty something loser still living with his mom in the terrible TV series King of Queens. 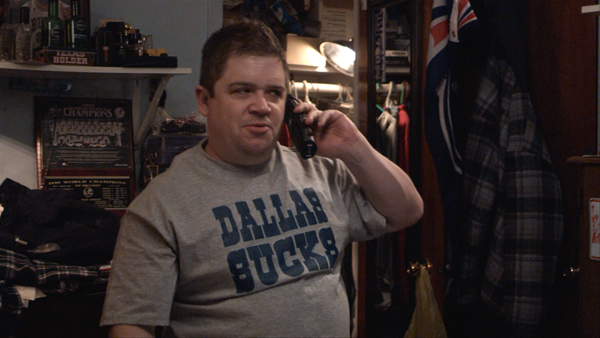 At risk of being typecast, here Oswalt stars as Paul – a shlubby thirty something loser still living with his exasperated mom (Marcia Jean Kurtz). Stuck in a dead-end job as a car park attendant, with no girlfriend and no aspirations, Paul spends most of his time either flying Han Solo under the bedsheets or calling up a lat night sports-radio station to spew scripted rants about the football fixtures and his devotion for the New York Giants. He’s such a huge fan of the fledging team that he and his best/only friend Sal (Kevin Corrigan) drive to the stadium every weekend to see them play. From inside with the roaring crowd? Alas, the pair prefer to park up and watch on a crappy portable TV from the comfort of their own deck chairs. It’s a pathetic bubbled life, but Paul wouldn’t want it any other way. It’s all change on one fatal night when Paul spots his favourite Giant sports star Quantrell Bishop (Jonathan Hamm – not that one) in a stripper club. Striking up the courage to talk to him, a misunderstanding lands him into hospital, and Quantrell suspended from the game. Pressured by the police officials and his discerning family, Paul wrestles with a moral dilemma – to press charges against his favourite sports star, or swallow up his last remaining remnant of pride and do what’s right for the future success of the team – nothing. It’s an interesting predicament that ends up engrossing around half of Big Fan’s running time. Perhaps the narrative is limited, but Oswalt is so crushingly fantastic as the pitiful Paul. Like Adam Sandler in Paul Thomas Anderson’s Punch Drunk Love, Oswalt uses his fragile demeanour to deliver a close to the bone, unforgettable performance of great depth; carrying the film and it’s absurd, tragicomic finish with ease. Although my adoration may not reach the obsessive heights of Paul and his hometown team, I’m a big fan of Big Fan. This entry was posted in ★★★☆☆ (3) and tagged big fan movie, Bobcat Goldthwait, Dramedy, gino cafarelli, jonathan hamm, kevin corrigan, king of queens, marcia jean kurtz, matt servitto, michael rapaport, michael simmonds, mickey rourke, new york giants movie, patton oswalt, paul aufiero, polly humphreys, Punch Drunk Love, robert d siegel, serafina fiore, the onion, the onion movie, the wrestler. Bookmark the permalink.